I assume that every multimedia enthusiast out there has taken notice of the acclaimed Oppo Blu-ray players. If you’re here reading this, then you are probably one of them. The current lineup of Oppo players consist of two models, the BDP-93 being the standard player and the BDP-95 which is the fully featured high-end version. I will link you to the Oppo website below so that you can compare them both. The Oppo lineup of Blu-ray players are by many considered to be the best performing players on the market. In fact so good that a few other brands use the whole or parts of Oppo’s players to make their own. I have had the pleasure to recently test the BDP-93 myself and thought I write something about it. 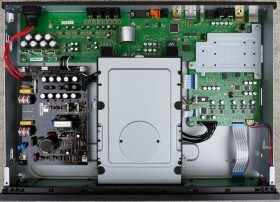 The BDP-93 is a refined and upgraded successor of the popular BDP-83, which was Oppo’s very successful first generation Blu-ray player. A factory-unlocked region free BDP-93 retails at writing moment for around €800 euro, while the flag ship model BDP-95 goes for around €1350. Already at the first look of the BDP-93 I think it’s a pretty good looking device. It only comes in black, but it’s very stylish with a black brushed aluminum front panel that looks much better in person then it does in pictures. The build quality is nice and the chassis feels sturdy and solid. When I power up the unit it is completely quiet, no noise what so ever! It’s not until now I realize that the BDP-93 is totally free from cooling fans, something I personally appreciate a lot, thumbs up for that. When I go back online to investigate I find out that the flag ship model BDP-95 on the other hand do have a cooling fan onboard, which according to rumors is quite noisy too. Before I go on I will assume that the Oppo BDP-93 to be used mainly in two different scenarios. One of them will be as a video processor and digital audio transport integrated into a full home theater solution where the BDP-93 is connected via digital link to a home theater receiver/processor. In this scenario the home theater receiver/processor would be decoding the audio for a 5.1 or 7.1 configuration. The other scenario would be using the Oppo BDP-93 as a stand-alone dedicated media player in a stereo hi-fi setup. In this case the Oppo BDP-93 would do all the video and audio processing and downmix the 5.1/7.1 digital audio to a 2.0 analogue audio signal connected straight to a stereo amplifier. The later of these two scenarios is how my setup looks like. Loading a disc into the player feels like loading a disc into any budget disc player, the mechanics is plastic and so is the tray and it makes some plastic-mechanic noise. However, BDP-93 makes up for that in load time. Even though it doesn’t load the disc and get to the menu nearly as fast as my HTPC does, it is far much faster than any other dedicated Blu-ray player I have tried, very nice indeed. The remote control is also made of plastic with rubber buttons and weights almost nothing. While entering the menus and selecting subtitles, making settings and such I straight away notice that the remote control leaves much to wish for. The good news is that when I used a Logitech Harmony universal remote the BDP-93 itself responded in a rapid manner, so it’s just a cheap remote, nothing serious. As for movie playback, well, I’m going to make this simple: The Blu-ray image quality is amazing! It by far outperforms my Intel Sandy Bridge based HTPC in color, depths and the clearness of the image. Everything is in perfect balance and razor sharp. This is what they are talking about, no doubt about that! Playing DVD with upscaling is not equally impressive. It looks okay but nothing out of the ordinary. Sadly there’s no DVD upscaling user changeable filters or options what so ever. This doesn’t bother me so much though since it is in fact primarily a Blu-ray player . Besides Blu-ray and DVD the BDP-93 play all sorts of video file formats such as DivX and Matroska MKV and it does it well. I did run into an occasional MKV that I ripped with MakeMKV that did not play on the Oppo BDP-93 even though it worked fine in VLC-player on my HTPC, but I have no idea why. The vast majority of files I played on the BDP-93 worked just fine though. BDP-93 also plays a wide variety of audio formats. It plays normal CD’s, SACD and DVD-audio but also audio file formats such as flac, mp3, wma and many others. I have stumbled into issues with flac support on other devices before where it takes time to buffer or skip tracks and other kinks, but not with BDP-93. It plays flac fine, skips track nice and fast. I played media files from both eSata and USB with success from drives formatted with FAT, FAT32 and NTFS, but other advanced file formats such as EXT, MacOS Journaling, or exFAT did not work. Media streaming over network seems somewhat limited as only DLNA server streaming is supported without any possibility to stream media from SMB or NFS shares. However, DLNA worked perfectly and the BDP-93 automatically detected my DLNA enabled NAS. I want to talk a bit about sound quality. Ever since Oppo released their first generation of Blu-ray players there has always been a “NuForce special Edition” of their players. With this edition the company NuForce, which are well known in the hi-fi world, has created an upgraded audio module for Oppo’s players. An upgrade that they say substantially increases the audio performance of the player. Also while lurking the web (Google) you will find several different DIY’s and/or companies that make and/or sell modifications and audio upgrades for the Oppo lineup. Why is everyone so eager to modify and upgrade the audio performance in their Oppo’s? Well, here’s the catch… It’s needed! For being such an awesome Blu-ray player it sure performs poorly when it comes to analogue audio output. Now please remember that I conducted this test using only the stereo analogue output from the BDP-93 directly connected to my stereo amplifier, no other sound processing in between. Obviously most BDP-93 users will connect the player via digital link, may it be optical or HDMI, to their home theater receivers/processors that will be providing a way superior DAC/audio processor to handle the signal, hence they will never have this problem. But the rest of the people who intend to use the BDP-93 as a stand-alone player for their 2.0 stereo and TV may not be satisfied with the sound performance. While watching a Blu-ray movie I didn’t at all reflect over the sound quality, in fact it was quite all right. It was as I started to play music CD’s and flac files when I first noticed how things didn’t quite sound as they do with my transport and DAC. I am not saying it sounds bad, but it’s not good either. The sound image is missing some detail and feels somewhat flat. There’s a quite noticeable roll off in the bass and nothing really sticks out, it’s just “there” but nothing more. From what I understand the BDP-93 does not have a dedicated stereo DAC but uses the same 5.1/7.1 DAC while decoding CD audio. The big brother BDP-95 does not only have a dedicated stereo DAC but it also has a much more expensive one. Hence I guess the BDP-95 performs better as a CD-player. As a test I wanted to take out the digital signal via optical cable and let my Cambridge Audio DacMagic do the analogue converting. This worked great as long as I played stereo audio or any audio files with 2.0 channels. When I wanted to play a Blu-ray using my external DAC I found out that the Oppo BDP-93 does not support digital 5.1/7.1 to digital 2.0 downmix. Only digital 5.1/7.1 to analogue 2.0 mode is supported. So unless you have an external DAC/audio processor that can downmix 5.1/7.1 you have to settle with Oppo’s internal audio decoding. However, I realize that the BDP-93 is indeed a Blu-ray player, and with that in mind it’s by far one of the best I have seen so far. If you’re on the market for a hi-fi audio player, this isn’t it, but if you are looking for an awesome Blu-ray multimedia player with lots of bonus features, then look no further. Did the cd or flac-sound improve from the Oppo when you played 2ch music using the dac in the setup, or did it sound about the same? My Oppo is currently connected to my Onkyo 905,(hdmi for blu ray and sacd, 2xRCA for 2ch music), would I have anything to gain by connecting the opt or coax from Oppo to my dacmagic and analog out from the dac to analog inn on the Onkyo? Or is the best solution: 7.1 analog output from Oppo —–>7.1 analog input on Onkyo and no dac? The Onkyo can handle full HD-sound. Hello! Using external DAC with the Oppo improved 2-channel sound quality in general, even for CD and FLAC audio. The over all sound quality improvement using an external DAC compared to using the integrated Oppo DAC was quite significant. So in your case I would use optical output from the Oppo to your Onkyo 905 and let the receiver do the conversion. The Cambridge Audio DacMagic has optical digital output/bypass, so you can let the DacMagic do the conversion for 2-channel music and then let it just pass the signal on to the Onkyo for multi channel conversion. Worth a shot. Last resort that I would do is to use 7.1 analogue output from the Oppo to the Onkyo for movie audio, and then optical or coax out to the DacMagic for 2-channel music listening.